Reporting Options. Wait a minute...I have options?? Business Intelligence, or simply “BI,” is no longer an expensive technology that’s nice-to-have. Instead it’s an affordable necessity for any business size from Small to Mid-size companies to Enterprise organizations, and is soon to become an even more significant part of your business eco-system. This can comprise of one or more of the different applications such as ERP/MRP accounting system, CRM, HRIS, Payroll and/or any vertical solutions. There’s no doubt that this economy has forced you to take a closer look at operational costs, workflow efficiency, and business expenses for opportunities to cut the fat and improve your bottom line. The theme in this economy is “How can I do more with less?”. Well the good news is there are actually a number of tools that are available without breaking the wallet. A number of these tools are even available at no cost. Yes! You heard that right .... a complimentary tool. These are BI solutions that can create detailed trend reports and graphical views that assist you getting these important information for your organization. Going forward, BI has created a new era for business software. It has changed the focus from simply capturing a lot of data to USING that data to improve operations and create competitive advantage. After all the data has always been there, but now BI puts it into a format that’s easy to slice, dice and understand. Gone are the days of compiling information and sifting through reams of static reports that are outdated before they even hit your desk. A BI portal can help you continuously draw information from your database(s) in real-time and proactively delivering reports, graphs, and spreadsheets that are waiting for YOU, not the other way around. BI today is powerful, simple to use, and no longer requires a programmer or technical wizard. It’s for that reason that BI has become mainstream and an affordable necessity for any business - big or small. So what are the options that we are talking about? Author new reports (organizing, creating, editing), as well as filter and aggregate data based on existing data containers and available fields only. Set permissions/security for both Intelligence modules and/or licenses as well as individual reports. 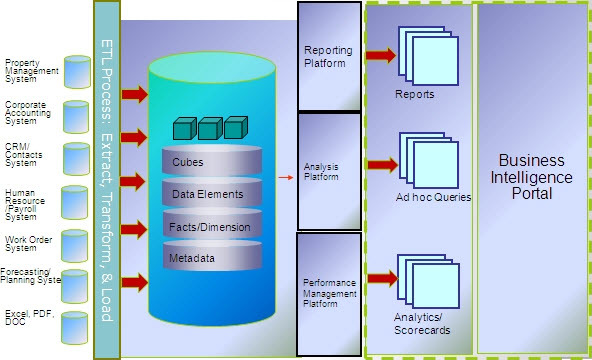 Turn your data into OLAP cubes and dashboards, allowing you to "slice and dice" and analyse your data in real time. Create your own formatting styles to highlight results - for example "traffic light" reporting. Save multiple views per cube. Create multiple charts per cube. Create dashboards based on views and charts. Views can be exported to Excel and CSV. Powerful BI tools without the usual price tag! Both options comes with a dashboard that puts all the pertinent at-a-glance information at your fingertips. I want to Activate my Sage Accpac Intelligence! I want to watch the Info-Explorer in action!